After SMX East last week yet another SMX is on. This time Stockholm is the place where people gather to listen to the experts. The keynote here was provided by Bill Hunt who talked about “Search 3.0”. Bill looked at the past, present and future of search, trying to give people an insight in how they should look to the use of search (and social) in the near future. Bill started off by talking about different phases in Search. Search 1.0 was pre-Google, ranking was relatively simple. It was on page optimization using directories and the good old meta keywords. Search 2.0 was when Google came along: anti-spam was a key factor of algorithm. Bill speaks about a research by McKinsey. It took McKinsey until July 2011 to talk about search. The implications is one of the charts: search expands beyond what we are used to. Search is a primary driver of growth. Big Idea #1: Leverage searcher stimuli: motivating people to seek out “more information”. You have to think about how the content goes further than just what you put online. How can you get people to take your content and let others take that further on the web. The crux is to look at the data you have with much more in depth. Look for people who have questions and craft your online activities around that. He gives the example of affordable Disney. A blogger was making a fortune by people clicking through because Disney didn’t have anything. Another example is the “3rd generation Prius”. Because they used a specific word which doesn’t exist yet, you can more easily track what people are actually talking about. Bill gives the example of how brands think differently than consumers. Some people wanted to know how well the speakers of a phone are so they could do a conference call with the loudspeaker on. They went to YouTube to look for a video which could show them the quality. Brands didn’t have videos there, amateurs did. Brands should probably look at this more quickly. – Where are your customers online? – What social information or people do your customers rely on? – What is your customers’ social influence? Who trusts them? – How do your customers use social technologies in the context of your products. – How do we use search to influence social behaviors? Bill tells the audience to combine search and social data. For 9 months they watched traffic on a website around labor day. 45 days before people were already talking about it. They started tweeting and mentioning it on Social Media. They talked about where they would go, what people are interacting with. Bill ended his talk with what he called a ‘mini rant’. He says that many believe paid and organic need to go together. He shows however than in some cases this isn’t true. People are losing more money on paid than winning on organic or vice versa. Everyone should look at their own stuff with a critical eye and not just do what everybody does. 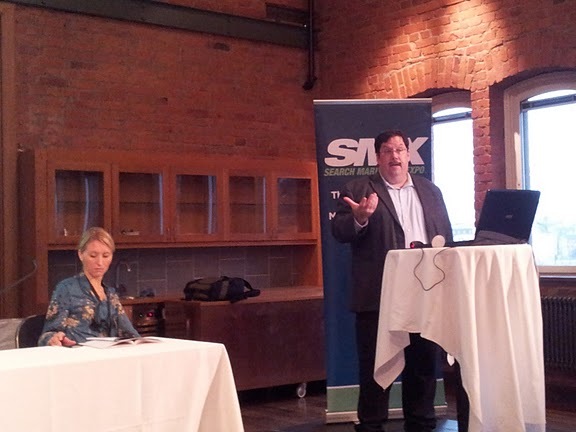 The coverage of SMX Stockholm on State of Search in part made possible by a sponsoring from Majestic SEO who have the largest Link Intelligence database in Search. To get your free trial, give a card to this blogger in person at the conference or drop us an e-mail.